The ALM Vanguard report ranks Customer Service consulting firms based on their capabilities to create client impact through their depth of expertise and the ability to deploy across a range of engagement models. In ALM’s in-depth analysis of global firms, the report highlights the effectiveness of KPMG’s Six Pillars approach to Customer Experience Excellence. ALM’s report cites KPMG as ‘Best in Class’ for its Customer Service Operating System capability and recognises the impact of KPMG’s Connected Enterprise framework in helping clients transform their customer experience. Customer service economics that includes rapid assessment of the customer-service landscape to prioritise change that balances cost-to-serve with value. Intentional service design that enables best practice customer journeys and service processes through intelligent data engineering and market alliances. 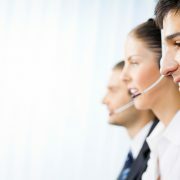 Innovative self-service capabilities that empower customers to self-serve more often and interact across channels. Modernised workforces that are equipped with digital tools to augment capability and deliver the highest value. 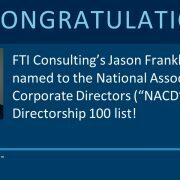 FTI Consulting, Inc. FCN, +1.28% today announced that Jason Frankl, a Senior Managing Director in the firm’s Forensic & Litigation Consulting segment, has been named to the 2018 National Association of Corporate Directors (NACD) Directorship 100 List, which highlights the most influential leaders in corporate governance. Mr. Frankl leads FTI Consulting’s Activism and M&A Solutions practice, working with companies and investors to develop and implement strategies to maximize shareholder value. He also advises management teams and boards of directors on how to proactively develop and implement defence strategies. 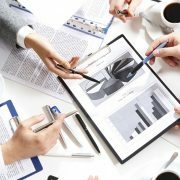 Mr. Frankl is a nationally recognized expert in Nasdaq and NYSE compliance matters, corporate governance and securities trading. He is actively involved with the Washington Lawyers’ Committee for Civil Rights and Urban Affairs and serves as Chairman of the WLC’s Corporate Advisory Board. He also recently served as a member of the Board of Trustees of the Radcliffe Creek School in Chestertown, Md. The NACD will honour this year’s winners during the 12th annual NACD Directorship 100 gala at Cipriani 42nd Street in New York on November 28. Honourees will also be featured in the November/December issue of NACD Directorship magazine. Evermay Consulting Group is pleased to introduce former federal special agent Susan Aarons as Senior Associate. One of the founding members of the Department of Homeland Security, Ms. Aarons has served in leadership positions spanning customs, immigration, counterterrorism, counterintelligence, and national security. She also served with over 42 U.S. Congressional committees during the mapping of DHS, including appropriations and funding. During her tenure, she directed the integration of national security and counterterrorism efforts across DHS and ICE and led ICE Homeland Security Investigations across more than a hundred FBI Joint Terrorism Task Forces. She served as a founding leader of the CBP National Targeting Center, FBI’s Terrorist Screening Center and the ODNI’s National Counterterrorism Center. Ms. Aarons also served as FBI Deputy Section Chief for Terrorist Financing Operations Section. Ms. Aarons led the effort to analyze, prioritize, develop and implement the first government-wide Terrorist Mobility Strategy, and was a pioneer/senior advisor for the Terrorist Identities Datamart Environment (TIDE) terrorist watchlist. She has led inter-agency surge teams, focused on training, capacity building and foreign counterpart coordination in support of Presidential policy directives for partners that included National Security Council, National Counterterrorism Center, departments of Justice, Treasury, Defense, and State. Her leadership earned her a reputation collaborative leadership with uncompromised integrity in the law enforcement community. Ms. Aarons is a recipient of several awards, including a Presidential Commendation and Secretary of Treasury Award, and nominated for U.S. Customs’ Agent of the Year. She has represented U.S. Law Enforcement interests to the intergovernmental Financial Action Task Force, established by the G7 to combat global money laundering and terrorist financing. “Ms. Aarons demonstrates Evermay’s commitment to deepening advisory repertoire and is one of several next-level Subject Matter Experts bringing execution insights to our clientele, empowering them to deliver more precise and effective mission solutions,” Dr. Sims said. 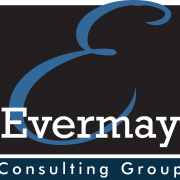 For more than 10 years, Evermay Consulting Group has provided advisory services to firms looking to enhance their understanding of DHS and other agencies’ missions. 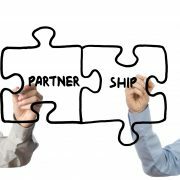 Our team is comprised of former government acquisition and program leaders who have not only lived the mission but have been agents of change from within the government procurement system itself. Evermay’s unbiased dedication to mission and mentorship has made them actively-sought advisors who daily help meet the challenges of homeland protection.